You’ve probably seen a double rainbow. That’s when the primary bow is flanked by a concentric secondary bow. They’re fairly common at my location when it’s raining near sunset, since the horizon west of me is low enough to often let the Sun peek under the clouds. And as you probably know, it takes both Sun and rain to make a rainbow. To see any rainbow, the Sun must be behind you, and the rain must be in front of you. 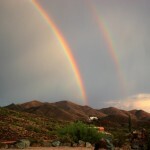 To see a double rainbow you need dark sky where the rain is coming down. This improves contrast and allows you to see the fainter secondary bow, which is almost always there, but usually invisible. Light from the Sun enters the falling (or suspended) water droplets, reflects off the back of the droplet, and emerges heading back in a specific direction: ≈40°-42° from whence it came. As sunlight passes through the water, it’s separated into the colors of the spectrum via a process known as dispersion. If you want to learn more about the physics behind rainbows, go here. The primary rainbow is 80°-84° wide. If you have the secondary bow as well, the total width is 100°-106°. So you won’t be able to capture it with a standard camera lens. For the shot above, I used a Zenitar K2 fish-eye lens, which provides a 180° diagonal field of view (cropped here). This was one of my first shots using this lens, and I hadn’t experimented enough to get the exposure quite right. Even after significant digital processing, the colors are still a bit washed out compared to what my eyes could perceive. However, several interesting features are visible. First, note how the colors in the secondary bow are reversed compared to the primary bow. The thumbnail below shows this effect quite clearly. It’s the same rainbow as above, but photographed through a different lens. Click on it to enlarge. This secondary bow is caused by a second internal reflection sending light back toward the source at a 50°-53° angle, and that second reflection reverses the colors. Finally, note how the sky inside the primary bow is brighter than that outside the bow. This effect is due to sunlight being reflected and scattered by the front surface of the droplets. 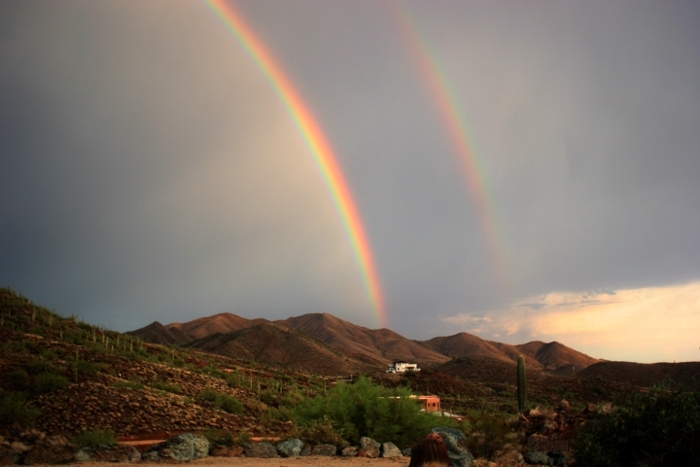 If someone tells you they’ve seen a triple rainbow they’re probably mistaken … or lying. Tertiary (and even quaternary) rainbows are possible, but they appear near the Sun in the sky and are difficult to see given the Sun’s brightness. Primary and secondary rainbows, by comparison, are always opposite the Sun in the sky. So next time you see a rainbow, consider that this beautiful optical phenomenon is the result of some very simple physics. And don’t let the physics get in the way of enjoying it. For me, understanding the physics behind rainbows makes them all the more enjoyable. It’s probably just a “geek” thing, but I can’t help it. Hey Mr. Science, one time I was driving from Oshkosh, WI to Milwaukee, WI and the weather was crazy. En route, there were places it was raining and places it wasn’t. The cumulus clouds were rolling across the sky and there were lots of opportunities for the sun to break through. There were rainbows EVERYWHERE! I have never seen anything like it in my life. Some were partial, some were full bows, some very intense color, some not so much, but on the 90 mile drive home, I probably saw 25 rainbows in many different sizes and intensities all over the sky. It was the most amazing show! Just wondering if that is a rare occurrence? I might add all the traffic on the freeway was going rather slow because all the drivers were enjoying the amazing colors. If it’s raining over a wide enough area, it’s quite common. Thing is, most of the times you see a rainbow, you aren’t in a car covering long distances and experiencing variations in the precipitation patterns and sun angle. And when you are, especially if it’s raining, your eyes are usually on the road. Here’s the thing that’s difficult to grasp about rainbows, but I didn’t want to get too much into geometry for this Sky Lights post. You can have two people standing side by side looking at a rainbow, but they’ll both see different rainbows. When it rains with the sun out, potential rainbows are everywhere. Each person sees the rainbow that exists around a point directly opposite the sun, and centered on the shadow of their head (where the eyes are). Next time you see a rainbow, look for your shadow on the ground and see if that isn’t the case. So every observer sees their own unique rainbow! To paraphrase an old puzzle … if rain falls on a sunny day, and there’s nobody watching, is the rainbow there? Answer: Yes, but without a pair of eyes to perceive it, the colored arc just sends its light out to infinity and the beauty is lost. Unless maybe some other animal is enjoying the view. Great shot of a double rainbow. I’m having my smartboard installed in a few days and plan on sharing your weekly Sky Lights column with my class each Monday. Sky Lights loves smartboards! It’s all about education. Nice to be a class guest in Two Rivers.